The Life of Bon: Freeing myself from clutter- creating a healthy home! Freeing myself from clutter- creating a healthy home! I came home from California Saturday night, took one look around my apartment and declared the jig was up! No more cluttered shelves, no more cupboards haphazardly crammed with tupperware, no more socks in my pajama drawer. It was time to clean up, organize, get myself a healthy home. I've been feeling this way for a few months. I've heard it described as this really weird term, "nesting." I'm not exactly sure what that term means and I know nothing about nests, but I do know that the clutter and random stuff everywhere is slowly driving my descent into madness. And so, starting this week, it's project "Free Yourself" at my apartment- freeing myself from clutter and junk and the stress that comes with it. Am I the only one that gets majorly stressed out when my home isn't in order? I blame my mom for this one, who never let us leave anywhere unless the house was clean. I'm tackling one project a day- starting with the laundry room shelves today. I will also tackle the fridge, the pantry, Greg's side of the closet, then my side of the closet (two days for closet! ), my bedroom drawers, the bins we have set aside for all things baby. All things must be organized! Wiped down! Cleaned out! Spring cleaning here we come! How weird is it that I am totally stoked to do this... genuinely looking forward to coming home from work each day, throwing on my sweats, and going to town on the clutter in my apartment? The first stop for my "free myself" from clutter project was Walgreens, naturally. Walgreens is my go to stop when I don't want to become overwhelmed. The store is small enough that I can easily walk through and grab anything I need without becoming too overwhelmed, while at the same time giving me a great selection. 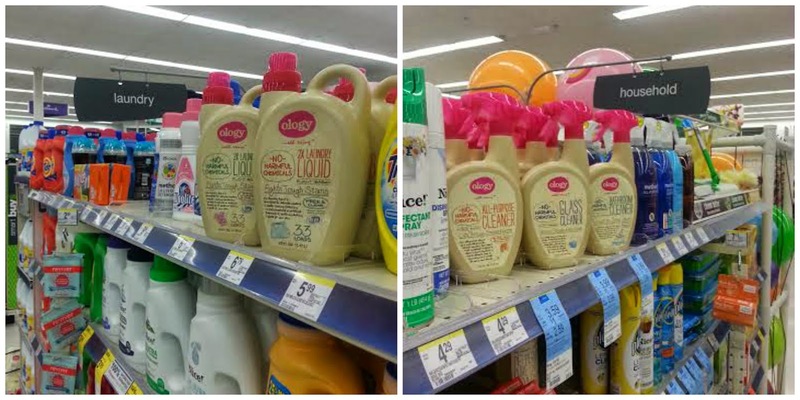 I was excited to try out Walgreens' new line, Ology. Next time you're at Walgreens, be sure to pick up some of their products. They are free from harmful chemicals and the paper products (toilet paper and paper towels) are 100% tree free. I always want to buy products that are better for me and for the environment without all the harmful chemicals, but usually I'm deterred by the price. I was so surprised and pleased to see that the Ology brand was still totally affordable while at the same time is friendly for our environment. ^^ Easy to find on the shelf, and easy to spot the brand. ^^ Like I said, the prices on all products were totally comparable with the normal products I buy. I got the above haul for $40. Paper towels, toilet paper, laundry detergent, bathroom cleaner, all purpose cleaner, dish liquid, shampoo AND conditioner for only $40. No more excuses for me to not use safer products! ^^ For cleaning my bathroom. ^^ For cleaning my kitchen. ^^ For cleaning myself- I just had to treat myself to new shampoo and conditioner! For more on the Ology brand (available only at Walgreens) and why it is important to have not only a clean home, but a healthy home, click on this video. Thanks to #WalgreensOlogy and #CollectiveBias for sponsoring today's discussion. Now it's time to get cleaning! I get stressed out when my house is disorganized too. I'm glad I'm not the only one! I need to get organized! There is so much wedding crap ALL OVER my house! Same here! I only moved in with my husband four weeks before the wedding, and we put "moving in" on hiatus after just two weeks. The wedding stuff came first! We have our final receptions this Saturday, and then we can FINALLY focus on making our house a home. Until then, wedding decorations, unpacked boxes of my stuff, and other random crap will remain strewn about the house. I noticed the shampoo and conditioner you bought are sulfate free. Have you ever used sulfate free shampoo and conditioner before? It was quite a shock to my hair, but once I got past the initial week of adjustment (stringy greasiness) I fell in love with it! I use the Burt's Bees Pomegranate Volumizing kind and me and my hair are so happy. I'd be interested to hear your sulfate-free experiences. I haven't noticed anything so far, but I've only used the shampoo and conditioner once. Actually now I'm really nervous! Is it always stringy and greasy to go sulfate free or is it just the adjustment period? I've been sulfate-free for a few years (I love the Organix brand! ), and I never noticed an adjustment period. It might depend on your hair type and/or your water. I have thick, curly/wavy, dry hair, so I have to go a really long time without washing it for it to be greasy. Also, sulfates were originally added to shampoo to create a lather in hard water. wow! good for you for having the energy to clean while pregnant! my sister jokes that she doesn't want to be anywhere near me when i get pregnant because i will use it as an excuse to get out of EVERYTHING. and she is probably right. I have never heard of this brand! I'll have to try it! I use sulfate free shampoo and have very fine hair, that has a tendency to look greasy if I don't wash it AT LEAST every other day. I didn't notice a difference between how my hair looked with the regular shampoo and the sulfate free shampoo. It definitely didn't make it greasier. WOW this bring looks amazing! Thanks for sharing, it's a great idea! It seems affordable too which is awesome. Spring cleaning is a must for me pretty soon! I've noticed the ology brand at Walgreens for awhile now and have been wanting to try them but kept passing over it because of all the times I've tried newer brands that were supposed to be good for the environment and just didn't do well. I think I'll actually try one soon as I need detergent anyway. Have you tried the laundry detergent? And did you like it? I'm eager to hear what you think of the shampoo and conditioner after a few uses. I've been curious about sulfate free but never found one that works for me. I tried Wen but after a while my hair seemed greasy and lifeless. Not at ALL like the infomercial beauties. Maybe it's me?